This was expected to happen – Paypal has informed their Indian users that, to receive payments in their Bank accounts from paypal, they will now have to furnish a Purpose code along with PAN (Permanent Account Number) and Bank Account details. Paypal has already put a crippling limit of USD 500 for receiving payments in the Indian bank account – and now this. I can understand Paypal’s perspective – They do not have any other option but to religiously follow the terms and conditions laid down by Reserve Bank of India. In accordance with Indian regulations, selecting a purpose for your transactions (i.e. purpose code) is essential. By choosing a purpose code, you help the regulators in identifying the exact nature of your cross-border transaction. This is required to withdraw (or transfer) funds from your PayPal account to your local bank account. It’s a onetime selection and the purpose code you add is stored and used as a default purpose code for all your transactions, until you select a different one. 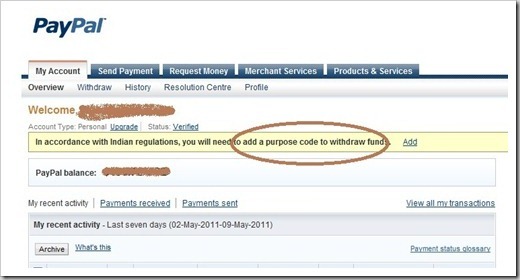 You’ll find prompts on the top of your “My Account” page asking you to “Add” your PAN, purpose code and bank account. Click on the “Add” links and follow the instructions. 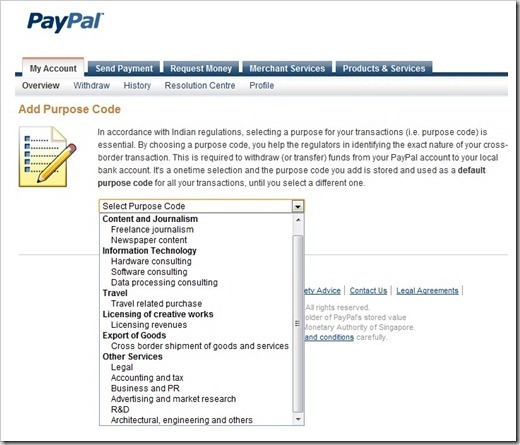 Interestingly, the list of purpose codes given by Paypal are at a high level and there will be many cases where users may not be able to classify it. Additionally, you cant set the purpose code transaction by transaction, which is also quite strange because purpose may be different for every transaction! I am really not sure how this is going to help – It must be a really frustrating experience for Indian users where people who dole off thousands of crores in scams go scot-free, while hardworking individuals have to to put up with stringent policy that cripple their even – meagre earning ! Weekly Wrap-up:Social Media Stats, Shemaroo Movies Online, USD 25 Computer & More..
Hey, I’m a student in college. I’ve opened up a new Paypal account for online shopping. I’ve successfully added my Bank A/C and PAN. Now Paypal is asking me for a Purpose Code. Which one should I select? I have committed to buy an item from ebay.com and thus have agreed and proceeded to pay via paypal.Accordingly, I have furnished my bank details,debit card details,PAN card number topaypal.The paypal account is verified.But now they are asking me to add bank details.The details which I have alredy entered before, if re-entered is being recognised as existing details.Still they are asking to add bank.Now do I need to add another bank account details of mine? Is this what pertains to Indian code of rules and regulations framed by RBI? Why should I furnish another bank account details when I have alredy furnished the one from which I intend to pay?I just cannot trust them now.Please help me folks. I’m a Homeopathic doctor based in Mumbai, India and clients/patiens from abroad countries consult me for medical advice/healthcare service and I charge them in foreign currencies. I require a Purpose Code to Receive Int. Payments. i am totally disappointed by limit of 500$. I dont understand why they are doing this?? If it is matter about tax then why dont then deduct TDS on the same? What is meaning of making limit for the same?